To migrate from a Microsoft Windows-based computer to an Apple Mac computer takes only one piece of software — Migration Assistant. 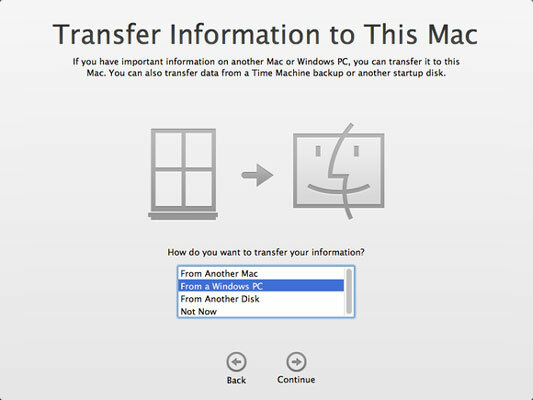 Transferring material from a PC to a Mac used to be a daunting task. Since Apple has redesigned and use Intel-based processors, migrating your files and preferences has become a point-and-click process. Before you begin migrating files and preferences, you must know what operating system (OS) each computer is using. During the boot process on your Windows-based machine, look at the splash screen and text that identifies what OS is loading. On your Mac, wait until the system loads, login, click on the Apple logo in the top left corner, and select “About this Mac. . ..” The OS version is one of the first bits of information displayed in the pop-up window that appears. Migration Assistant for Windows supports Windows XP and above only. Sorry, dinosaurs, but Windows 95–98 and older are not supported. Migration Assistant for Mac is built into all Macs running OS X 10.6.3 and above. An older version of Migration Assistant available in operating systems prior to 10.6.3 (Snow Leopard) but only allows migration from one Mac computer to another — no form of Windows support is included on this older version! To use the Apple-based Migration Assistant on a Windows computer, you first must download and install the software from the Apple support website. Before you start migrating your data, make sure to turn off Windows Update to avoid interrupting the migration process. You will be presented with a warning window if your updates are turned on and won’t be able to continue until you turn them off. Also before starting make sure to use an external power source — not battery power, since powering off the computer mid-migration may cause irreparable damage to both computers’ hard drives! After you have turned off automatic updates and plugged in your computer (if applicable), you can now launch the support application and select the OK button. The application will ask you to launch the same application from your Mac while waiting for the Mac to connect. To use Migration Assistant on Mac, open the Finder, navigate to Applications, open the System Utilities folder, and then launch Migration Assistant.app by double-clicking the application icon. Keep in mind that you can also launch Migration Assistant from your dock’s Launchpad (silver rocket icon). Select the data you want to preserve from your Windows computer and then click the Continue button. The computers are now migrating your selected files and folders; this process can take a while depending on the amount of stuff you are moving across the network. Be patient, you’re almost done! When the application has finished making changes to your computer, you will be asked to close the application and restart the computer. See, that didn’t take so long! Keep in mind that migrating your files to a Mac does not mean you are able to migrate your software and Windows applications. Software and applications are typically OS-specific. To be able to continue to use Windows-only software, such as a current version of Microsoft Internet Explorer, on an Apple computer, you must install a copy of Windows on a second hard drive partition or external hard drive with the help of Apple’s Bootcamp Assistant. You also may consider keeping your Windows computer and using a KVM (keyboard-video-mouse) switch to be able to use the same monitor and human interface devices for both computers — dual setup style.